If you start the trail from the dam at the far end of the State Park (farthest you can drive after passing through the gate), you ride across the grass dam and up into some logging area. There's a small sign that directs you to the "hiker's trail," and it starts with a pretty steep single track with wooden steps built in. After that, the first half of the 3.6 mile loop is mostly single track, and even though the gate guard said maintenance hadn't been out there this season yet, it was in pretty good condition. There are some bridges built in across most of the brooks, and the riding is moderately easy, with some ups and downs and some tricky sections. After that, the trail starts to open up into a wider, double-track(ish) kind of route that is a lot hillier, with some good ups and downs. At the very end of the trail, it dumps you out onto some horse trails, so be prepared for some loose sand and mud if there's been any rain. There are a couple of places where you can turn right or left, and I always went left, which brought me back to the entry gate of the state park. From there its about a mile and a half on the roads of the park to get back to where you parked your truck/car. It's a pretty quick ride, but as there doesn't seem to be many good trails around here, its a nice little afternoon 30 minute ride. There was really only one place where a tree made me "bushwhack," and that wasn't bad at all. Very pleased! 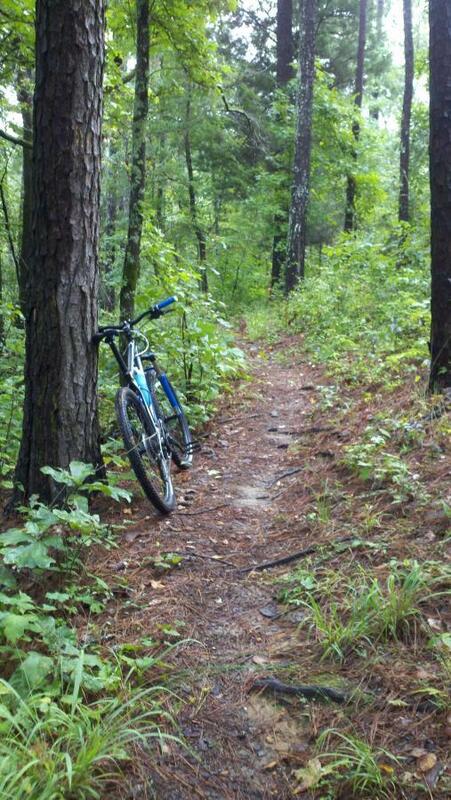 Review: Another "Not a mountain bike trail" in Mississippi. You can ride here but make sure it hasn't rained in a week. There is no maintenance on this trail and the Ranger is a grumpy old man who roams the park looking for minor violations like double parking in an empty parking lot, but I digress. The actual trail is singletrack for a few miles with some stairs for hikers. It is about a 20-30 minutes ride if you start at the dam. there is a low point towards the end that becomes a swampy pit of water and 3-6 inch deep mud. Lake Lowndes has great potential but poor management. Bring your tent and Kayak instead of the bike. If you want good riding, try Lake Lurleen or Noxubee Refuge. For a closer quick ride check out the research park in starkville. Review: This trail could definitely be fun, as other reviewers have said, if it were maintained. If I didn't have to duck branches and bushes or stop to step over logs so often, this trail would have been very fun! I asked the ranger if he needed help maintaining the trail and he said they just finished work on the horse trail and this one is next so he doesn't need help. Hopefully it gets done! Review: These trails have allot of potential!! Very beautiful area. Review: See other reviews! I rode 2 weeks ago. The camp host gave me directions to go over the dam (see other reviews). NOT A BIKE TRAIL! I spoke to the ranger after my ride and he stated the park does NOT maintain or encourage the hike trail be used for bikes. The horse trails are what the management expects bikes to use. If there is any interest, I would love to get a trail improvement/maintenance group together and just take over this trail as it has a lot of potential. The state ranger has no interest in making or maintaining this hike trail as a hike/bike system. Trail conditions were: bridges washed out, broken, mis-aligned. Bike traps: wash-outs, muck, stairs (actually I enjoyed this aspect). downed trees/overgrowth. Lousy trail markings in places (or ridiculously over-marked). I will keep visiting, but I will take a pair of garden sheers and a hammer to repair bridges. I would love to see some bridges built of the ample on hand materials (trees) that spanned the entire drainages bank to bank not just at the bottom. As they are, bridges are poorly placed, above or below grade, and very narrow/slippery. Similar Trail: none - this is about the worst maintained trail I have seen in a while and I just hiked 75 miles of the Florida trail. Review: A friend of mine and I rode these trails earlier this morning, yes it is a very wet and muddy trail, but for the most parts, if you are a good rider, you can handle it. It even started raining on us at one point. It was a a nice cool down. The trail is basically a loop around the edges of the lake which begins at the dam of the lake and then ends back at the main entrance gate, where you ride the paved road back to your vehicles from there. If you have rode on the research park trails in starkville, you'll love this trail as well, lots of downhills to get up good speed. Several places are a bit tricky to ride and you have to walk around a few places(a few steps areas, one tree down across the trail, and one bridge had caved in) and also you need to be able to duck, there are some low hanging trees that if you don't watch it, they will clip you off your bike. But overall a great, really fun trail that gives you a wonderful workout. I wouldn't consider this an advanced trail though, yes it is kinda tough, but I believe its more of an intermediate level trail. Its either that or just my idea of an advanced trail is completely different from the guy who put up this trail. For anyone who rides it, make sure you stay on the hikers only trail or as the guy before said, you will get lost. Review: This would be a great trail if Mississippi ever had a dry season. If you hit it at the right time, the lake is very striking at sunset. Hiking paths/singletrack for most of the trail, giving way to equistrian trails near the end. The hiking paths make for great switchbacks and quick descents. Not the best maintained trail though, and several sections are consistently so muddy that it's impossible to ride through. Bring a towel. Lowndes County State Park MTB Trail 3.43 out of 5 based on 7 ratings. 7 user reviews.